Cases of failed root canal treatments can now be successfully treated, thanks to modern technologies. A failed root canal treatment can be potentially recognised by pain and/or swelling. Magnification loupes/ Microscopes with fibre optic lighting system have improved a dentist’s vision and therefore the chances of the treatment’s success. Ultrasonic devices allows the endodontist to more efficiently and accurately remove old root canal materials and other intra-canal hindrances so that a success can be achieved even with most difficult root canal failure cases. Improved instruments, better materials and medicatements for disinfecting, filling and repairing root canals and innovative new technologies have lead dentists and the patients to get re-treatments completed for a higher number of root canal failure cases. The bacteria Enterococcus Faecalis has been found to cause some root canal treatments to fail. Iodine has been found as an suitable disinfecting agent which kills this bacteria and increases chances of re root canal treatment success. The dentist are now able to treat the root canal cases with better diagnosis and visualization thanks to new technologies such as digital radiography. Also the radiation exposure has been greatly reduced with digital radiography. Today, well-trained general dentists and root canal specialists (endodontists) alike can perform non – surgical endodontic root canal re-treatment which is very cost effective, time saving and quite predictable as compared to other treatment alternatives like tooth extraction. But at times the root canal failure case cannot be re-treated by non-surgical methods. In these cases dentists can use surgical endodontics to re-treat a root canal failure case, which may be preferred over tooth extraction. 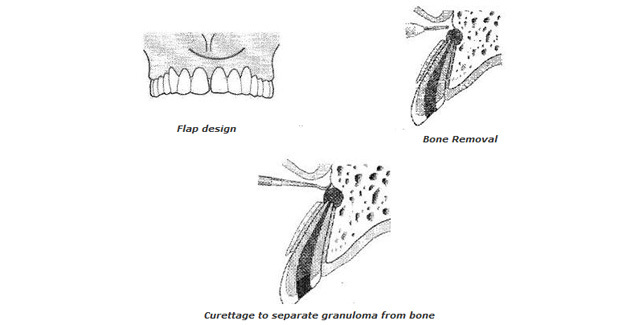 The main aim of Non-surgical endodontic procedure is to save the endodontically failed tooth. But at times, patients’ own dental crown needs to be removed. In some cases access can be made possible through the existing crown. This crown may later need to be replaced. Post and core removal or any broken instrument from the root canal/pulp space. Locating and treating the earlier missed or undetected canals. Making way through the blocked canals and by-passing/repairing canal ledges. Repairing any mechanical and pathological perforations of the root present. Once these objectives are achieved, the root canal space is cleaned well, re-shaped, completely disinfected and finally sealed. A protective restoration can then be placed in the end to restore the proper tooth form, function and aesthetics. Mostly root canal re-treatment can be done in 1-2 sittings. However to make a final restoration for the tooth, this may take another 2 sittings if required. Most root canal treated teeth are restored with dental crowns. Patient may on occasion experience some pain and soreness for several days after root canal re-treatment procedure. For pain relief after root canal re-treatment, patient can take general pain medications. Root canal re-treatment will remove the infection from the tooth and will relieve pain and discomfort of the patient. Root canal re-treatment saves natural tooth structure and treated tooth can function for years and can function throughout life. Success rate and prognosis of root canal re-treated tooth is not as good as root canal treatment done for the first time. If root canal re-treatment is unsuccessful, then patient can get endodontic surgery done or can opt for tooth extraction with replacement of missing tooth with dental implants or dental bridge. These are variable and depend on the complexity of the case but can be anywhere from £450-£950. Root canal re-treatment is a safe procedure but complications may occur after procedure. Re-infection may occur after root canal re-treatment. To avoid any complications after root canal re-treatment, procedure should be done by an experienced endodontist or specially trained dentist. Surgical method of treating a root canal failure case involves raising a small flap adjacent to the involved tooth in order to gain entry and treat the root canal infection. Surgical line of root canal treatment is a minor in office procedure done under local anesthesia. When the infected area is exposed the dentist performs curettage (the removal of diseased and infected tissue by scooping). This is usually followed by the apicoectomy procedure in which the infected root portion especially the root tip is removed. A small filling is then placed from the root end side to seal the left healthy part of the tooth root. Surgical endodontic procedure tends to give a good long term prognosis if the entire infection can be effectively eliminated. Unfortunately at times the re-treatment efforts and surgical endodontic procedures may not be possible or cost-effective and tooth extraction may be the only alternative. But to save a previously endodontically treated tooth which is failing is usually possible and predictable, being the most conservative option for the patient.